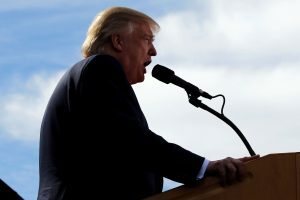 PORTSMOUTH, N.H. — A beleaguered Donald Trump sought to undermine the legitimacy of the U.S. presidential election on Saturday, pressing unsubstantiated claims the contest is rigged against him, vowing anew to jail Hillary Clinton if he’s elected and throwing in a wild, baseless insinuation his rival was on drugs in the last debate. Not even the country’s more than two centuries of peaceful transitions of political leadership were sacrosanct as Trump accused the media and the Clinton campaign of conspiring against him to undermine a free and fair election. “The election is being rigged by corrupt media pushing completely false allegations and outright lies in an effort to elect her president,” he said, referring to the several women who have come forward in recent days to say that Trump had groped or sexually assaulted them. He has denied the claims, calling the women liars. 100% fabricated and made-up charges, pushed strongly by the media and the Clinton Campaign, may poison the minds of the American Voter. FIX! In a country with a history of peaceful political transition, his challenge to the election’s legitimacy — as a way to explain a loss in November, should that happen — was a striking rupture of faith in American democracy. It was not the first time Trump has raised the idea the election is unfairly tilted against him, but it has become a resurgent theme for the New York billionaire and many of his supporters in the past several days as he’s slipped in preference polls and faced allegations of sexual misconduct. “Participation in the system_and particularly voting_should be encouraged, not dismissed or undermined because a candidate is afraid he’s going to lose,” he said. “I think we should take a drug test prior to the debate, ’cause I don’t know what’s going on with her,” he said. Trump offered no evidence to support the bizarre claim, which he appeared to base on his belief Clinton was energetic at the start of their second debate and downbeat at its conclusion. Nothing about Clinton’s demeanor in the debate suggested she was anything but clean and sober.